Our new USB IO board - SimpliBox IO - is now available in our webshop. Simplibox IO is not only a simple USB relay. In difference to other products it comes with opto isolated inputs and fits perfectely in an optional din rail enclosure. We provide C++ and Python code for the host system. It's suitable for Windows and Linux - and a perfect accessory for our RasPiBox enclosure kits. 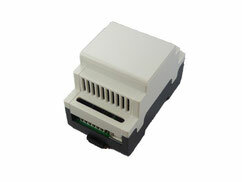 The first buyers of these new kits will get a nice DIN rail enclosure for free! I am looking for a USB controlled motor circuit to use in my self project. The SimpleBox IO will satisfies my needs in new project. If you have further questions don't hesitate to contact us.